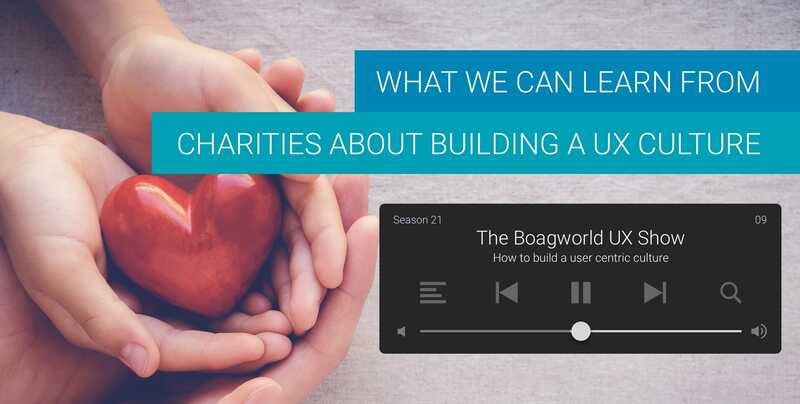 Paul Boag: This week on the Boagworld Show we're joined by James McDiarmid, the head of digital at UNICEF, to discover how they've put digital at the heart of their organizational approach. This week's show is sponsored by Balsamiq and FullStory. Hello and welcome to the Boagworld Show, the podcast about all aspects of digital design, development, and strategy. My name is Paul Boag, and I'm joined as always by Marcus Lillington. Hello, Marcus Lillington. Marcus Lillington: Hello, Paul Boag. I'm very hot and sweaty. Can we make this one very quick? Paul Boag: Yes, yes. It's too hot. There's too much going on. My house has been full of people, and they're … Yeah, it's chaos. The world is chaos. I've got too much work as well. Marcus Lillington: That's not a bad thing, Paul, not something to complain about. Paul Boag: Oh, I manage to complain about anything, you know me. Marcus Lillington: Moo, moo, moo. Paul Boag: Moan, moan, moan, this gorgeous weather, it's really annoying. Marcus Lillington: Yes, that's true. Paul Boag: That's a proper British thing to do, isn't it? Marcus Lillington: Yes. Oh, yeah, I don't like it when it's this hot. Paul Boag: No, it's too hot. Marcus Lillington: Yes, now it's too hot, yes. Marcus Lillington: We spend all our time moaning about how gray and miserable it is. Marcus Lillington: I don't moan about this weather at all. Paul Boag: Do you know what I am moaning about? Is for two days on a trot, I have tried to make it to the pub to sit in a beer garden at lunch time. Both times, I have got half way down the road when I've got a phone call that's made me come back. That's just unacceptable. Marcus Lillington: Ooh, rats, Paul. Marcus Lillington: Yes. Is that demanding clients? Paul Boag: Well, actually, no, both house-related, it's always house-related. Marcus Lillington: Ah, right, right. Where do you want this doing? How do you want us to finish off this little bit here? Marcus Lillington: Yes, yes. A million questions. Marcus Lillington: You know what? I think they care about me, and they don't want me to have to sit around and get too hot and sweaty. Paul Boag: Yeah, there's nothing more distasteful than the thought of a hot, sweaty, middle-aged man, is there? Marcus Lillington: No, that's really quite unpleasant. Paul Boag: It is quite. With that in mind … Are you in the office today, or are you at home? Marcus Lillington: I'm in the office with the lorries trundling past and the fans going and all of that. Paul Boag: Yeah, that office is not nice is it for heat? Paul Boag: This is really not of interest to anyone, is it? Paul Boag: Do you have a thought for the day? Marcus Lillington: I do, but again, I've been a bit lazy, because I thought, well, if I'm going to come up with something new, I should do that for the last one. Not that I thought what that new thing is yet, but hopefully during this week it will occur to me. I thought I'd go back to probably my most popular blog post I've ever written, or certainly one that I refer to the most. Which it's a story about user experience, and how the tiniest thing can sour the whole experience. I've certainly told you it before, Paul, but there might be the odd person out here who haven't heard me blathering on about my washing machine story. Paul Boag: Oh, the washing machine story. Marcus Lillington: Yeah, it's just quite a … As you know I recently spoke at the Continent Conference and even that … Even when I was talking about customer journey mapping, it became relevant at one point. I didn't talk about it, because I ran out of time at that particular talk. But I did a similar talk at the Engaging Networks Conference, and I just went off on a little bit of a tangent and suddenly thought, what I'm talking about here is relevant to this story. I shall relay it here again, and I promise it will be the last time it's mentioned on this show ever, ever. Paul Boag: Okay. I'll hold you to that. Marcus Lillington: Ever, ever, ever, ever. Okay, well, about 18 months ago, I bought a washing machine as you do. The UX of the site and the company that owns the entire thing, it was their delivery process, everything was so good … Because when I bought the washing machine I shopped around like you do, and you check the different prices. But anyway, the UX that I experienced when I bought the washing machine was so good, it prompted me to buy a new dishwasher that also broke down six months later directly from them. I didn't look anywhere else, I just went to their site and went, but they're just so brilliant, I'm going to buy directly from them again, and so I did. The company's called AO, AO.com. They sell washing machines, dishwashers, fridges all that malarkey. If you go to their website, and you buy anything, you can't help but be impressed by how well they handhold you, how good the microcopy is, everything, the descriptions, there's nothing on there that's unnecessary. It's just really good. When the guys come and deliver it, they're really polite and helpful and move stuff around for you anyway. It's like this works. It's modern customer service or modern customer experience done right. Anyway, the second time with the dishwasher, one thing went wrong. I received a call from them prior to delivery disguised as, "We just wanted to check you've ordered the right item." Marcus Lillington: But it was actually, "We want to sell you insurance." Paul Boag: Ooh, not bad. Marcus Lillington: Mmm, yes, bad. It set up in the first place … I've got no problem, no objection with the company saying we've got these other products that we … If you want to get some cover, we can provide it for you. All right, that's fine, I'm going to say no almost certainly. It's a policy of mine not to buy cover for these kind of things, and I think that over my lifetime, my very long lifetime, I've saved a lot of money. But that's a different story. Anyway, I've got no problem unless they're trying to hoodwink which they were. But the worst part of this, added to the fact that they disguised the call as something else, the guy on the phone used some very strong coercion-based sales techniques to get me to agree to sign up. The main one being, he didn't ask me if I'd like to sign up for a particular option, he just assumed that I'd accepted it, and it took me say … There was three items, every single one, I had to say, "Hang on a minute whoa, whoa, whoa, I don't want that." Every time I said that, it was met with mock surprise. Marcus Lillington: "Well, if you're sure." Basically, it just made me think, I can imagine 80% of people going, "Oh, well, I really ought to have this," and paying the money. I am willing to give … Well, I was willing to give AO.com the benefit of the doubt, in fact, because I actually bought something else again quite recently, say two or three months ago. I got the same, a similar experience. Marcus Lillington: They have lost me forever. That's the lesson, if you like, from this. Basically, tricking people into signing up for a secondary product which is … These things are hundreds of pounds, so it's not like you're adding on just a fiver or something. It's going to repeat … It's likely to lead to zero repeat business from me, and I suspect I'm not alone. Now, I look at this kind of thing all the time, and I'm sure that these people will have some really horrible targets that they have to meet. That's where the problem lies. Marcus Lillington: They've got there … They will be … The insurance sales department will be there in their own silo, and they will be measured by how much money they make. That's it, full stop. There's no consideration for how the practices of that department affect repeat business, and they've lost me. I won't be going back again because of that one experience. I call this particular part of this blog post a fly in the ointment, and that's what it feels like. It's like there's no holistic view. You'd think, because the experience that you get on the website is so good, it's really surprising that this was allowed to happen within that company. Yeah, the whole moral of the story is if you mess up one little thing, you can mess up the entire experience. Paul Boag: Yeah, absolutely. I recently wrote a blog post on dark patents, and it was talking about exactly that. That you, yes, by using … It was dark patents in this particular case. Yes, you are going to improve one metric. You are going to improve your conversion rate, in the same ways those people on the telephone would have got additional sales out of that. But what they don't see is the other metrics that are damaged as a result. Paul Boag: I think because they work in silos. More returns, more support calls, more marketing costs to be able to counteract the loss in repeat purchases that kind of stuff. I wrote another post actually which is very recent which was on trust. How important building trust is with customers if you want them to trust you with their money and to deliver their product. Like you say, it only takes one little thing, and it can completely undermine that kind of trust. Marcus Lillington: It's a house of cards, Paul. Paul Boag: … and then I stopped doing it. But the show notes are boagworld.com/season/21/episode/210 … and this will be, nine. Paul Boag: Yeah. A bit long-winded, but it will get you there, and we'll put links to relevant stuff. Also, we provide a complete transcript as well which, obviously, is another really useful good thing. Okay, that's that. Let's talk about our first sponsor. Marcus Lillington: Is it Balsamiq? Paul Boag: No, I'm doing them in the other order. Marcus Lillington: You've done it this way around for the last six of them. Paul Boag: I know. Well, I thought it was about time FullStory got to go first. Why should they always be second? It's not fair, is it? Marcus Lillington: I couldn't agree more. I think that you've been favoring Balsamiq lately. Paul Boag: Oh, ho. Now, I feel really bad. Marcus Lillington: Just to make your life difficult. Paul Boag: It's like I've got these two lovely children, but there's one that I favor over the other. Marcus Lillington: Which one do you love more, yeah? Paul Boag: This is why I only have one child, avoids that kind of problem, so there we go. FullStory, yeah, so FullStory is a next generation analytics offering. That sounds really pretentious, and that's not their wording. That's mine, so that's really embarrassing. Basically, in my opinion, it's the best analytics tool I've ever seen. But, it's not just an analytics tool, it's also a session recorder. What always happens with Google Analytics is you go, "Oh, I really want to start … I want to know how many people are clicking on this link," or this whatever. You hadn't thought about that previously. You just … At some point, you decided. Even though you'd been running Google Analytics for ages, you can't get that data, because it doesn't have an appropriate event tag on it. You don't have that problem with FullStory. One script, and it records everything. All of the DOM, all of the activities, so it means you can get up and running in minutes. You can get as much data as you could possibly want. It basically tracks every event, every click, every swipe, every scroll, every bit of text that's selected or viewed or done [inaudible 00:12:26]. It's all instantly indexed and searchable to you. On top of all that, it's also recording your session. You can watch back how users actually behave on the site. It really is absolutely superb. They've got no sampling. You captured every single user session which is amazing. You can start today absolutely free. You can get a month of their pro account for free which will record every session. There's no need to enter credit cards or anything like that. If after the month of getting every session recorded, you're happy to compromise down to 1000 sessions per month which still isn't bad, then you can continue to use it for free forever which is amazing. If you need more than 1000 sessions per month, because you want to run it on every page of your site, then no problem, you sign up for their pro account. You can do that by going to fullstory.com/boag, so check that out. Paul Boag: I had a little chat, it was only yesterday actually, with James from UNICEF. Now UNICEF is an amazing organization as you probably already know. They are the United Nations charity for helping children in need. They're all over the world. They're absolutely massive. I went to speak at their conference in Amsterdam recently where they basically bring everybody together from across the world, and they all share and learn from one another. It was a really great experience to see how a huge, huge multinational organization shares knowledge and learns from one another. I met James when I was over there who's the head of digital at UNICEF UK. I said, "Well, let's get you on the podcast." He was kind enough to agree to do that. This is the conversation I had with James. Hello, James, and thank you so much for joining us to just chat a little bit about UNICEF and your role there. Do you want to kick us off by telling us a little bit about what it is that you do at UNICEF? James McDiarmid: Yeah, sure. Personally, I'm the head of digital engagement at UNICEF which basically means, in the UK, I'm responsible across the organization for making sure that we're moving forward digitally as an organization, looking at new opportunities to use digital and also thinking about how we embed digital culture throughout the organization. Paul Boag: That sounds like a fairly big job. Do you have a team? How big's your team? Give us a little bit of background. James McDiarmid: Yeah, there's been a bit of change here recently. The digital team in its core form is about 12 people, and it's a multidisciplinary team across content, marketing, technology, and data analytics. That team acts as an internal consultancy for the organization, so working with various stakeholder teams around the organization to look at their processes and ways of working and opportunities for growth and, yeah, just doing things a bit more effectively and often utilizing more modern ways of working. Paul Boag: Mm-hmm (affirmative). That sounds interesting that you've managed to build a team that is cross-disciplinary. Which is very different to a lot of the clients that I'm working with. They often, "Well, we've got the marketing people in our team, and then the developers sit over in IT." You've got them all together in one team, is that right? James McDiarmid: Yeah, those digital specialists when a … We went through the whole kind of digital-first process that most organizations went through over the last five years or so, and we're now really looking at how we mainstream that back into the organization again. Very much what you're describing was where we started of individual people with individual digital competencies scattered throughout the organization but without any real joined up strategy or really making the most of those resources. We've gone through the process of pulling them together into a hub-and-spoke format to really drive forward that strategy and that multidisciplinary approach. Now what we're looking at doing is how we embed that culture and that way of working and the processes that go along with it back out into the organization. That way we don't hold onto digital as something that digital people do. But that we really set out into the organization but in a way that really maximizes the impact rather than it just being fragmented throughout the organization. Paul Boag: Yeah, that process of bringing everything together, and you talked about a hub-and-spoke model there, do you want to unpack that a little bit more for people in terms of what that looks like? You had people spread out everywhere. Did you co-locate them together, or did you create a virtual team? How did that work? James McDiarmid: Yeah, so very much brought them together so as much as possible bringing everybody together to facilitate that kind of multidisciplinary way of working, foster collaboration across different skill sets. As I said before, the team act as internal consultants, so they'll also … They function as a single unit, but they'll also spend time taking their various specialisms. We might have an email marketing specialist within that team who would then go out and work with the stakeholder teams around the organization who are the biggest users of email as a marketing channel, a direct marketing team, for example. Individually, they have quite close and deep relationships around the organization to help push forward those skills that they're responsible for. But, they are a single team and sit together as a single team as well to help spot those opportunities for bringing different perspectives and different skill sets to bear on bigger challenges and more of the cultural change and new processes and ways of working. Paul Boag: When you talk about hub-and-spoke, you're talking about people going out from your central team and working with stakeholders. Do you ever do it the other way around and bring stakeholders into your central team and get them working alongside you? James McDiarmid: Yeah, probably, sorry, excuse me for coughing, a little bit less commonly. But it's certainly something we have done over the years. It's really important, specifically, we've been working to get some of the key teams around the organization to really think about their own digital competencies. We've got teams who are really marketing-focused, rather than recruiting people from say within the not-for-profit sector who might have lots of fundraising experience or legacies and gifts and wills experience. Looking at how we get them to think about what those people are actually doing and to us we see them as marketers and very often digital marketers. Looking at how they can then go out and recruit those core digital skills themselves. Then teach them how to do the thing that that team does. We have had a really great success here with as mentioned our legacies team. It's a very traditional market where it's mainly focused around probably a 45 plus audience and looking at people who are creating a will or looking at those next steps in their lives and trying to get them to think about leaving a gift for UNICEF and the work that we do around the world within their will. It's traditionally a very offline sector, but we were really keen to look at that and go that creates a real opportunity for somebody to be doing this in a more digital way. Knowing that that demographic is … As much as people tend to think they're a paper and face-to-face generation, I'm not sure about you, but I certainly know my parents are avid users of Facebook and have iPads. They're actually quite a technologically enabled generation. They may not be as savvy as the younger generation, but they certainly aren't lacking the tools to be engaged on those channels. Yeah, getting them to recruit somebody who came from a digital marketing background to then run their campaign and really help the rest of the team learn those skills and adapt to those ways of working. Jumping back to the question, when we've had those people join the organization, we're always really keen that they spend some time with us as a team and embed them within our ways of working as well. Yeah, bring them close and then let them back out into the organization to really have an impact. Paul Boag: It's sound like that's where you're at in a broader sense now. You've done the centralization. You've done the setting standards and that kind of thing. Now you're devolving authority back out to the individual parts of the organization as they become more digitally savvy and digitally enabled. The question is then, what does your central role become as more power goes back out to the rest of the organization? James McDiarmid: Yeah, it's a really interesting question, and it's one that we certainly grappled with for a while when we were thinking about what that next step looks like. I think what we landed on was originally when the whole digital-first and digital transformation piece happened, it was very much a skills-based conversation. People speaking to "digital types" to learn how to use Facebook or understand how social media as a broader thing might fit within their marketing plans. What we're seeing now is that that shift change has happened and people understand that people who are responsible for our organizational strategies get it to a large degree. But what that central function now becomes really pushing is not the skills piece but the broader cultural and process development. How does UNICEF UK as an organization become really agile and flexible as an organization? Because that's, as we push those skills outwards and as they're embraced around the organization, that's increasingly what people are seeing the need for and the demand for. If you're working on social media you need … Things like three-week long sign-off processes don't work anymore. You need to have an organization which is flexible and quick to respond and adaptable. For us, our focus is now much more on that side of things of, okay, we've got the skills developed, how do we enable the culture that will really let those skills flourish within the organization? Paul Boag: That's quite an interesting area then. How are you going about doing that? Is that about establishing new standard operating procedures? Are you looking at creating service manuals? What's your approach for tackling that? James McDiarmid: Yeah, at the moment, we're really focusing on, essentially on our senior leadership and working with them to look at how the organization operates, and what the big accelerators can be. We're very fortunate. We're about to move buildings. One of the big decisions that our senior leadership were keen to take was to move us from … At the moment, we're split physically across three or four floors. They knew that that was an inhibitor to that type of collaboration and awareness of what other people are doing and then speed and ease of communication as well. They've made the decision that they're looking … The new office is entirely across one floor. Similarly, looking within that how do we locate ourselves to make sure that we're not reinforcing old silos, but getting organizationally, the value across multidisciplinary or cross-functional ways of working. We know that, that's a really powerful thing, but how do you … It's that question of, how do you enable that at an organizational level? How do we get our fundraisers working with our communications teams, or our program delivery teams working more closely with our ambassador relations team? All those, bringing those different perspectives and skill sets closer together, and those are the pieces that at the moment we're really focusing on. What are the big things that are going to have the biggest impact that we can deliver within the organization? It's quite … It's an interesting space. Working, as I said before, when we were talking more skills and capabilities that's quite an operational level discussion. Now it's very much stepping up into that much more strategic and organizational strategy side of, how do we become the 2.0 or 3.0 organization that we want to be? Paul Boag: It sounds like you've got quite a lot of support from your senior management team. Did that come from them, or have you … You had to work on them? What's the story there? James McDiarmid: It's definitely been a mixed bag. UNICEF, I suppose at the highest level, UNICEF is a global organization. UNICEF UK is just one part of that global organization. But within the global organization, there's a real strong recognition that digital is a key enabler of our long-term goals. All of the outcomes that we're trying to deliver for children around the world work backwards. Certainly from a communications and fundraising and advocacy perspective, they all work back towards being enabled through … Whether it be the increased reach, the increased efficiency, the more creative problem solving space that digital, and I'm increasingly wondering whether that's the right word for it, but let's stick with it, is able to facilitate. There's a lot of support at that level. Within UNICEF UK, there's certainly an appetite and an awareness that we need to be doing this. But, also, an increasing recognition that there's a knowledge gap. That's not a negative reflection on our leadership team. I think it's a reality that lots of organizations are facing. That you've got these key decision makers within the organization have come up through their careers and progressed, because they're really good at what they do. But the context of what they do has changed radically over the last five or 10 years. We're really looking at how do we support and enable those leaders to feel confident and to feel capable and empowered to make the … I hate to use the word right decisions but, again, make decisions that are going to help the organization become more modern and more fit for purpose in the 10 or 15 years to come. Paul Boag: In some ways, it's quite an endorsement of your leadership team that they've got the maturity to go, "Well, look, we know we don't know about this area, but we know it's important." A lot of management teams, that's quite a hard pill to swallow, to recognize that the world has changed on you, and that maybe not all of your knowledge is applicable now, and there are gaps in it. James McDiarmid: Yeah, absolutely. Again, we've been really fortunate, I suppose, on two fronts. One is we've had a new CEO come in over the last couple of years. James McDiarmid: That's always a good shakeup and a good time for change to occur. But we've also had … We have a board of trustees, as many charities do, all charities do. One of the steps that the organization has taken is to appoint two what are being called digital trustees. James McDiarmid: Trustees who have … They have wider value to the organization as well, but one of the key things that they're brought on board for is their knowledge of and their contacts in the sector and awareness of the digital space. That's been incredibly helpful. One of the initiatives they have really pushed forward is getting, we call them digital inspiration sessions. Having speakers from the likes of Spotify or the NHS Digital or these amazing Facebook or whoever it might be. It's really amazing organizations and very different and disparate organizations as well. We're not looking to them for answers to how to do this but more inspiration of going, look at the myriad of different ways that people are tackling this. That it's a shared challenge. Which I think really helps from a leadership perspective to know that this isn't just something that UNICEF UK is grappling with. This is something across every sector, is the hot topic. It's a really hard nut to crack as well. Nobody's got … There's no manual for it. It's just a matter of trying to work your way through the problems as they crop up. Again, leveraging those things like bringing in different perspectives and iterating and learning and embracing failure and all of those wonderful things that people talk about in the agile and digital spaces. Paul Boag: You mentioned a couple of times, you talked about UNICEF UK, and that obviously, UNICEF is a broader organization as a whole. How do they … Does the broader organization fit into all this? Tell us a little bit about how UNICEF is structured across the different countries, and how that impacts digital, or if it does? Do you work purely on a country level? How does it operate? James McDiarmid: Yeah, UNICEF is a big organization. We work across 190 countries and territories around the world. Organizationally, it's structured into three tiers. We have our HQ functions which are based out of either New York or Geneva. Those broadly, for the sake of simplicity, split into three key functions. There is our programmatic HQ, so you can think about that as the unit that's coordinating the delivery of programs, whether that be immunization programs or education programs or water and sanitation programs around the world. There's also a communications headquarters function and a fundraising headquarters function. Those are the three key strands within the organization. If you come down a level from there. We split from a fundraising communications perspective. We operate what are called national committees. There's 36, I think at last count, national committees. They're what UNICEF UK is. Primarily, they're advocacy fundraising bodies who are there to support the work that the global organization is trying to do. They tend to exist in more developed countries, the U.S., lots of European countries, some of the bigger Latin American countries, and certainly across Asia as well. Their role is to promote UNICEF as an organization. To unlock resources whether that be financial resources or whether that be partnerships with corporates or governments or whatever they may be, anybody who's able to assist us in what we do. As well as that public engagement piece, so using advocacy, getting the public to sign petitions, or write letters to MPs or whatever it might be to, again, apply pressure to support the work that UNICEF is doing. Outside of that we have the country offices. This is the biggest by number. I think we've got about 130 or 140 country offices globally. They're country-specific program hubs. Where HQ might be talking about water and sanitation globally, a country office in Central African Republic, for example, will be coordinating and delivering those programs on the ground in their country using local resources and really trying to contextualize the big strategy down to a country level. Because, obviously, every country and culture is different and requires unique solutions and ways of working. That's a very quick structural overview. It's a big organization. With that brings a lot of advantages but also a lot of challenges. Like any big organization, it's a bit of an oil tanker to move around the place, and that's certainly the case from a digital perspective. Paul Boag: How does it work from a digital perspective then? You're obviously doing some quite advanced stuff in the UK, both in terms of your deliverables but also in terms of culture and organizational structure. Is any of that dictated from above at a global level, or is it all driven at your level? If it's driven at your level, how do you ensure that other countries benefit from what you discover? Are there economies of scale going on there? I'm interested in how you learn from one another if that makes sense. James McDiarmid: Yeah, it's a really good question. There's not a straight forward answer. But as you touched on there, there's lots of dynamics at play. The national committees and, certainly, I see my role within the UK national committee as again just trying to support, as much as we can and in whatever way we can, what we're doing globally. Often, the UK is a very mature market from both public communications and public relations and fundraising and marketing and all of the good stuff that goes in there. It's a very both mature and competitive market. But also we're fortunate to be able to have the resources to do things well. We're very aware that, that's both a privilege but also a responsibility to the rest of the organization. That we need to be sharing, what we know and what we learn, as much as we can. Some of it is directly relevant. Looking at other national committees, we can definitely be sharing as peers, and our global organization really do whatever they can to facilitate that. Whether that is just at a low level introducing counterparts in different organizations. We host a skill share conference. There's lots of opportunities for that knowledge transfer. Equally, what we do at a NATCOM level isn't necessarily directly applicable to the country offices. Because they're much more in that program delivery space, and we tend to focus more on fundraising and communications. We do have some UK-based program work, but it's a different beast. Centrally, we'll, staff will often be looking at how they can deliver capabilities to those country offices. That's a centralized model where they'll be procuring a CRM system or delivering training or putting together best practice. Simply because most of those offices don't have the human resource or the expertise to be able to do that in a meaningful way. If we can package up things and deliver them to the country offices, it can be incredibly powerful for them. But, equally, it means that they can focus on doing what's most important for them to do which is fundamentally looking after and protecting children. There's a balancing act to be had. Again, we'll try and support them in that. The CRM example, we've just gone through the process of implementing a new CRM system. We'll be sharing and have constantly been sharing loads of learnings about that process back to the global organization. As they're now going through the process of looking at how might they procure and develop a centralized CRM system which can support the country office network and even some of the smaller national committees. There's a real culture of wanting to share information and, say, reap those economies of scale. But we're also acutely aware that the NATCOMs and HQ and country offices operate in different contexts. Also, at a country-specific level, there's so many nuances and differences that we can't just template and dictate. We have to think really intelligently about what are the core competencies that we're trying to support and let the people on the ground who know how to deliver the work that they're delivering best, customize it to their needs. Yeah, it's really interesting, and it's certainly one of the parts of the job that I enjoy the most, is that kind of ability to scale the impact of what you're doing. If we do pilot something, we've been doing quite a bit of A/B testing and optimization recently, looking at how we can share that out with the wider organization. Hopefully if it is applicable in their circumstance, they can just take it and run with it rather than having to do the hard work themselves. Paul Boag: It's more about … It sounds like it's very much about sharing rather than a more formalized, "We're all going to work from the same set of standards." Is that a fair way of describing it? James McDiarmid: Yeah. There's certainly … The goal, as I said before, is to look at where there are opportunities for standardizing. There certainly are plenty of them. But balanced with that awareness that sometimes standardization isn't the right answer. Sometimes to be the most effective in whichever context it may be, we need to be able to adapt and change to the local context. Paul Boag: Okay, I think a lot of people listening to this are going to be little bit envious of you. Because I think you've got yourself into quite a nice position or a good position where digital has become seen as business critical. You've got leadership on board. You've got people on the senior leadership team who've got digital experience. You're getting support from them. You're undertaking this cultural change campaign. What I'm interested in, what tips can you give people to getting in that position? What's been the big thing that's happened to enable that? Has it been getting those trustees on board with digital experience? Has it been … Yeah, what's it been? I said before, it would be unusual, I think, in most large organizations to find senior leadership who were involved enough or experienced enough for the technical details to get the impact at that level. But if you can contextualize it into those business outcomes, that's a language they do understand, and they are more than willing to embrace and probably are far more experienced even than we are. I think it's that classic understand the audience that you're trying to influence. That said, definitely taking a two-pronged approach, so engaging from the top down but also don't neglect engaging at the bottom up. Because you're both … You need the strategy, but you also need the tactics and the capabilities at an operational level. Otherwise, you'll just get pressure from above that's really difficult to deliver on from below. That A, creates awkward challenges, but, also, it's just a bit unfair to the people at the delivery end. I suppose one thing I'm particularly passionate about is across a lot of digital transformation programs training and upskilling is always a huge area of focus. I absolutely believe that, that's the case. But I think it needs to be done in tandem with bringing in skills. You can train people, and you can upskill people. But that takes … That's a long process, and it takes a lot of time and energy and resource. Also, certainly in the not-for-profit sector, we have quite a high rate of turnover. You invest a lot into those people and building those skills and capacity, unless you've got a really, really strong culture of knowledge retention, it disappears, and then you've got to do it all over again. It's a bit of two steps forward, one step back. If you can shortcut that process a little bit by actually parachuting in some real experience and some real skills that's … Those two things complement each other immensely well. You'll leapfrog your current state by getting some fresh skills in. I think it's something that a lot of organizations miss a trick on by thinking that it's one or the other. That there's this idea of burn down the organization and hire everybody new or train them up. Because that's the culture we want. We want to be seen to invest in our people. Whereas, actually, it's a combination of the two that will get you the furthest, the fastest. Paul Boag: Yeah, I totally agree with that absolutely. Yeah, no, that is spot on. I agree with all of that. I particularly like the bit about digital transformation isn't really about the technology, but it's about how it's changed people, and it's changed the marketplace and those kinds of things. Absolutely spot on, James. Thank you so much for your time. Really good to hear what's going on at UNICEF. Where can people find out more about you, or find out more maybe about what your team is doing? Do you post anything online anywhere? James McDiarmid: Sadly, we're not big bloggers. That's something that's been on my mind recently of creating a bit more transparency around what we're doing. But often members of the team are kicking around the conference circuit in London and territory sector circuits. Obviously, if people are keen to understand a bit more about what UNICEF itself does, pop onto the website at www.unicef.org.uk. But yeah, it's been a pleasure talking to you too. Paul Boag: Okay, thank you very much for your time. There you go. That was a great chat from James from UNICEF, really very insightful look into how they're working. Have to say that the UK people seem to be very sophisticated in the approach they're taking and coming on leaps and bounds really. What was your impressions of it all, Marcus? Marcus Lillington: Well, the main one was that it reminded me so much of MSF. Marcus Lillington: Structurally, certainly, although I'm still not 100% sure how UNICEF is structured even though he did it explain it. Paul Boag: Yeah, they're actually almost identical in the way that they're organized. MSF is … You might know as Doctors Without Borders, and it was one of our previous clients. Marcus Lillington: Yeah, [crosstalk 00:49:32], sorry, carry on. Paul Boag: I know that UNICEF and MSF learn a lot from one another. Paul Boag: Rip each other off, depending on how you look at it. Marcus Lillington: Yeah, let's see what they're doing. Oh, yes, we can … I did like the fact that he viewed his team as an internal consultancy. Marcus Lillington: I thought that was a really … I think part of the problem with digital transformation early on is this idea of a digital team is viewed as a service department. But selling yourself as an internal consultancy that's there to help people out, I think is … That's much more of a grown up or serious way of looking at it which I thought was great. Also, one thing he mentioned that he didn't … I wanted you to ask him, how he did it? But they said they had success with legacies, because that is the holy grail for charities. Marcus Lillington: He might not want to say. Paul Boag: A, he might not want to say, and B, also it's like that's very specific to charity people and charity stuff, and there was so much broader things I wanted to talk to him about. I just … It was very interesting to hear how they had successfully repositioned themselves like you say as a consultancy. Also the fact that his attitude was very much that their job as a team wasn't to just implement stuff but was to advise and evangelize and to grow that culture across the whole organization. I thought that was a very mature approach to it all. Marcus Lillington: Yeah, and the fact that they … This idea of bringing people in and telling people this is how it's going to work. We're going to bring you in, and then we're going to set you free kind of thing. Marcus Lillington: I think that must have really worked well, but then I was thinking all the time, well, how did they get people to actually do that? Then it came out, Paul, we had a new CEO two years ago, and we're talking very much in business terms to our senior management. It's the same messages are coming through on a lot of these interviews. You need to have buy-in from the very, very top, and you need to talk to those people at the very top in their terms. That came through right at the end. Marcus Lillington: Spreadsheets or figures. Paul Boag: Yeah, it's not just about that. It's about connecting with the things that they care about. It's not just about presenting UX in a business-y sounding way. But it's actually repositioning UX as solving fundamental business problems that they already care about. There's that classic article by Jared Spool that I'll also put a link into the show notes, where he says, "I've never convinced an executive of anything and neither can you." He goes on in that article to basically say, well, you can't convince an executive of anything, but you can show how great user experience will actually help solve most of the problems that they already care about. The things they're already passionate about. Marcus Lillington: Yup. We had him on the show yonks back talking about that very thing. Marcus Lillington: Go back and find it, it was a good one. Marcus Lillington: Not you, no. Those people listening. I wouldn't expect you to, Paul. Paul Boag: No, I'm far too lazy for that. I might … I suppose I could search on my own website. It's not beyond the wit of man is it really? Anyway, great interview, thank you, James, very much for coming on the show. Paul Boag: … you seemed very worried that they didn't get their normal place at the beginning of the show. Marcus Lillington: Well, no, I felt they were getting too much attention. Paul Boag: Oh, yes, of course, you did. I forgot that. Okay, so Balsamiq … I'm almost afraid to mention them, because Marcus feels that they're getting too much attention even though they're paying to be on the show. You know, that's fair enough, isn't it? I don't know. What do I know about this stuff? Marcus Lillington: As did we. Paul Boag: Yeah, exactly. I ended up doing most of my prototyping in tools like Sketch combined with something like InVision. Now that's all well and good for people like me that use Sketch all of the time anyway. But what about people that aren't designers, all right? Prototyping tools can be pretty hard to learn, and there are more than professional designers out there with ideas that we need to take on board. There are people like product managers, business owners, consultants, programmers, all of which don't want the learning curve of learning a full-blown prototyping tool. They just need something to very quickly be able to express their idea. That is where Balsamiq comes into its own, and where it's really valuable. It's democratized the design process, allowing non-designers to participate in it. Admittedly, some designers have got a problem with this, because they think they should be in control of everything, but they can get stuffed. Because they're wrong, blatantly. Because I honestly and passionately believe anybody can have good design ideas and can contribute to the process. We need a way for them to be able to express those ideas, and Balsamiq is that way. You can get a 30-day free trial. Also, if you sign-up with the code boagworld when you actually get to the point of entering your billing information, you'll find the ability to add that code. That will give you an extra three months using Balsamiq Cloud absolutely free. You want … They do have a desktop version, but you want the cloud version, because that's great for collaboration. It's easy to show clients stuff. It's easy for them to comment on it or make changes, all that kind of stuff. You can do that by going to balsamiq.cloud, so check that out. Okay, Marcus, what do you have for us joke-wise? Marcus Lillington: My mate, Rog, told me a joke the other day which I rather like, so I shall repeat it here. Henry the Human Cannonball died the other day, but the circus are having trouble replacing him. They can't find someone of the same caliber. Paul Boag: Although my son who is super-pedantic would probably point out that you don't have caliber on cannonballs or something like that. Perhaps you do, perhaps I'm wrong. Marcus Lillington: They're all different size, yeah. But whether it's called caliber, it's probably done by weight. I don't know. Marcus Lillington: But, yeah. But that's a good joke, Rog, well done, mate. Paul Boag: … in keeping this short. Marcus Lillington: Well done, us. Paul Boag: Yeah, so I think both of us deserve a pint and to sit in front of a fan about now. What do you reckon? Marcus Lillington: That sounds like a very good idea. I'm certainly going home now. Paul Boag: With that, goodbye, and we will see you again next week for our last episode of this season. I hope you can join us. Until then, bye-bye. Thanks to SewCream from Shutterstock for allowing me to use this image.